If you’ve got the spring-cleaning bug how about showing your mattress some love? Consumer Reports’ experts reveal why it’s important to clean your mattress and show you the best tools for the job. 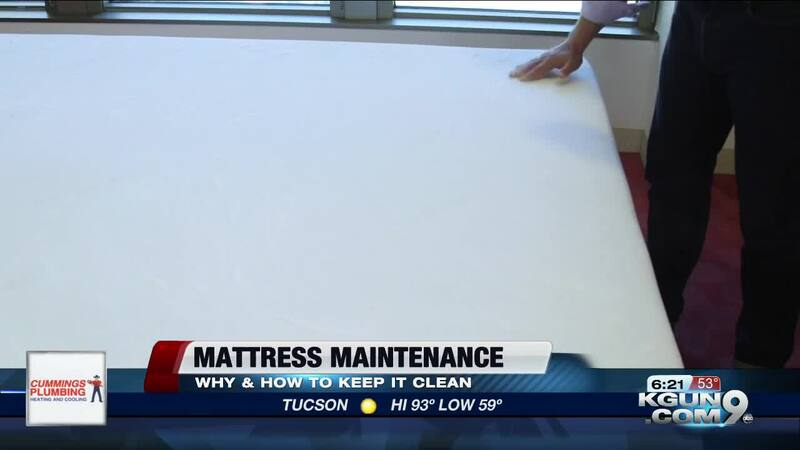 TUCSON, Ariz. - You spend about a third of your life sleeping -- and sure you change your sheets but how often are you cleaning the mattress you’re sleeping on? Consumer Reports says freshening up your mattress is a good idea for many reasons. “Cleaning your mattress is really easy to do and it can help remove dirt, dust and other allergens. Plus, it can actually help extend the life of your mattress," says Consumer Reports Home Editor, Dan Wroclawsk. “You want to pay special attention to the crevices and seams of your mattress - that’s where dirt, dust, and dead skin and other icky things can collect," says Wroclawsk. “You’ll want to try using an upholstery cleaner or enzyme-based pet odor remover. Those work well on most kinds of stains and odors," says Wroclawsk. “It is a little inconvenient but we recommend either sleeping in another room of your house or planning to do it while you’re away for the night," says Wroclawsk. CR says, if you can, leave the mattress near a window. The sunlight will also add sanitizing power. And finally, after 24 hours, vacuum up the baking soda and enjoy your fresh, clean mattress!